i'm brand new to this concept - but a blog carnival is basically a blog-hosted article (like a magazine article) on a particular topic, with lots of links to other blogs on the same topic. several bloggers can band together to take turns hosting a carnival...and get a conversation going! so i'm gonna try hosting a carnival on papercrafting - with the first "edition" coming out here on november 5th about making greeting cards or note cards from scraps - paper trimmings, sample swatches, old cards, clippings, etc. an example is the collage card i made from a paper manufacturer's old swatchbook. if you have ideas or resources for my first article - leave me your comments on this post! they say your first anniversary gift is supposed to be paper...so a couple years ago, i made my husband a photo album with pictures of us together, using a heart-shaped blank board book. each side of the seven pages has one photo that i printed out in sepia tone. i inked all the edges of the book with my trusty permapaque paint markers, then covered some pages with papers, others i painted with ranger colorwash spray paints (which i love working with, so easy to spritz and smear around for different effects). i added some different embellishments, i especially like the embroidered fabric letter tabs. this was a really fun card to make! i wanted to use up the rest of that pastel cardstock i had, and paper snob that i am (it's just plain ol' 67# vellum bristol, a very low-end grade) i was looking for new ways to disguise it and make it into something "high-end." i layered a pink velvet flocked paper, a green metallic paper, and a turquoise textured paper. i used a black permapaque marker to ink the edges of all the papers so the contrast of the colors and textures would stand out more. the punched out dragonfly in the corner is raised up on little adhesive foam pads, so he's hovering, like dragonflies do. a little glitter pen to outline the "negative"dragonflies, and a few self-adhesive rhinestones in blue and green...when i was done i screamed out "oh my god, that's so cute!!" which made poor glenna scream and jump out of her chair, shocked by my sudden interruption of our deep-in-creative-concentration silence, which made me laugh hysterically for several minutes before feeling bad for startling her. today i tried collage cards, using this leatherish bumpy paper in a few different colors. i cut a bunch of strips at angles first, then just started piecing them together on a card, trimming edges as needed to get all the pieces to nest together. i left a few "flaps" unglued just for the heck of it. I used small squares to anchor the design, and they also served to cover a few wonky intersections! i also tried blending these hard angles and prominent texture with a distressed fritzy floral paper to see how it would look...it's a little busy and wierd (bordering on ugly) but i still kinda like how it turned out, not sure what in the world appeals to me about it. when it comes to cardmaking, i tend to design as i go...either that, or i decide i want to use up certain papers and goo-gaws, so i force myself to work only with those things. it's kind of a fun, challenging way to create. i love craft days (daze)...we just cover the dining table with oodles of tools and supplies, and go to town. this may look like a chaotic mess to you, but to me...it's where i want to sit for about a week and a half straight. today we worked at glenna's house, in 2 weeks we'll work at my house. glenna is making really cute journals - xmas gifts for a group of friends in her quilting guild. she got basic school notebooks and covered the front and back with pretty paper, then embellished (painstakingly!!) with die-cuts, ribbon, adhesive rhinestones, stickers...she also does amazing things with rubber stamps and prismacolor pencils. so i had this set of pastel pre-folded cardstock, with envelopes and coordinating papers and embellishments that came with a fun cardmaking magazine i got from england, so i put together a set of 4 cards - 2 birthday and 2 thank you's. i used my sakura glitter pen to highlight and outline...it adds just a tiny touch of sparkle. tomorrow is a craft day at my friend glenna's, i'm looking forward to it! i like making "patchwork tile" cards - with a square punch and some interesting papers, it's easy and fast to arrange and adhere the little squares to cardstock and embellish with ribbon and metallic dots. i just use double-stick scotch tape for most of my cardmaking - it's no muss, no fuss. plus my neighborhood grocery store was getting rid of its office supply section and i bought like a jillion rolls of tape for 50 cents each....hence my adhesive of choice. i also like scrappy cards - i save most of my paper scraps. some days i just pull out the bag, dump it on my table, sift through it and see what grabs me. this is a set of small notecards that i still need to make envelopes for, then they'll be a nice little gifty. if you don't believe me, check out this book...(i know becky will love the cover!) 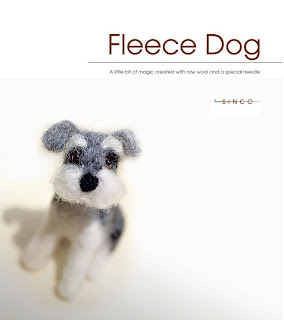 the author included optional instructions on how to blend in your's pooch's hair with wool to make an adorable little needlefelted dog. in fact, she made a pair of corgi's for the queen of england using her royal doggy locks. needlefelting is really fun and pretty easy, it's like painting and sculpting with loose bits of wool and a pokey needle, although i haven't tried making these puppies yet. anyway, think twice before tossing out that pet hair on the bottom of your swiffer—one girl's dirt might be a queen's treasure! how many cards can a cardkeeper keep? i love making cards...i stopped buying greeting cards a few years ago, they're just so much more fun to make. sometimes i make just one as needed for a specific occasion, and other times i get in the zone and make a whole batch of generic cards. that reminds me, it's time to call my friends together for another craft jam, it has been too long! 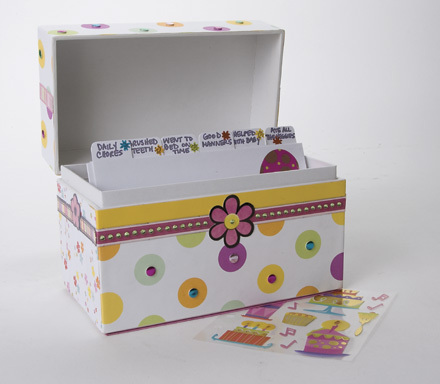 anyway, so here's the perfect thing to store my card stash in...this is a blank board box that holds about an inch's worth of 5x7 greeting cards. 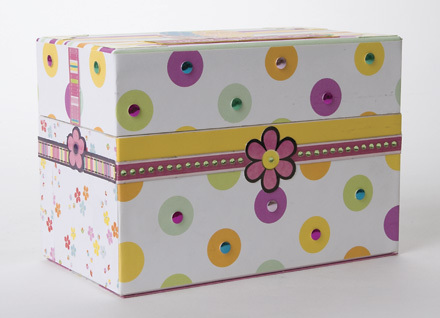 it's a pretty cool construction, the lid is hinged with a little magnet closure, really easy to get in and out of. 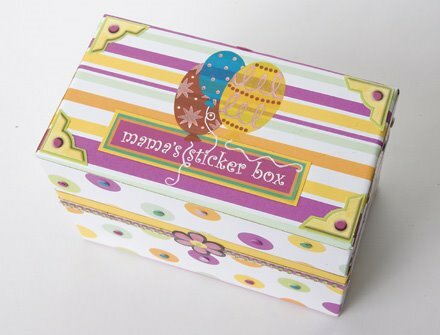 i was too lazy to create a template to cut around the peek-a-boo window in the lid, so i colored all the edges of the box with a bronze paint marker (sakura permapaques), then tiled strips of textured paper together, on the top, bottom and all 4 sides...a great use for scraps. in fact, this paper came from an old swatchbook sample from a paper manufacturer, these were all the colors in their pallette...i don't let much go to waste when it comes to cool paper. i added some heat-set rhinestones with my handy-dandy Bejeweler tool in the corners, and then glued a heart-shaped piece of art glass (thanks glenna!) on top of the plastic window. this scrapbook is not as morbid as it looks! i designed it for someone to put in all their halloween costume pics through the years. the first page is titled "creatures of halloweens past" (may they rest in peace). the door-shaped blank board book is also the perfect shape for a headstone. i used black and white pastel crayons (i love sakura's cray-pas) to paint the cover so it looked 3-dimensional—shadowy, aged and cracked. then i remembered a technique that lea cioci demonstrates in her book, where you dab a little paint thinner (mona lisa odorless brand) on top of pastels to break down the pigments and blend the colors. i took a chance and tried it in the corner, and somehow it turned into this wonderful glossy splotchy green, which looked just like moss growing on the headstone. i love it when experiments become part of the design! it has been 20 years since my dad passed away, it's hard to believe i am getting close to the age he was when he died. a few years ago i gathered some of my favorite pictures of him and our family, and put together a memorial album on an 8x8 black board book. that's my brother and me on the front with dad, playing with a newly unwrapped toy, christmas circa 1972.
i was pleased to find out that a crop-a-dile tool punches holes into the thick board stock just like butter, which makes decorating with grommets easy. the black surface is beautiful, it doesn't need to be painted or covered with paper. rub-on transfers stand out really well against the black too. inside with the pictures, i included clippings of his handwriting, cartoons about his name "fred", things that reminded me of his desk, the first card i gave him as a child that i signed myself, a newspaper picture showing him and mom with friends, and quotes from his memorial service. what i love most about using board books for scrapbooking instead of regular photo albums—is that they can stand up with the pages fanned out. i keep my special scrapbooks like this one displayed on my hope chest where i can always see them. well, kinda sorta...my cousin rhonda couldn't attend my bachelorette party (summer '05) so she sent a cher impersonator to attend in her place. into the restaurant walked this 6 foot tall MESS of a drag queen who made a hilarious scene, and we sang "i got you babe" together in all of our margarita-laced glory. good friends, good food, good fun! i put my pics into a 6x6 board book, on textured and translucent papers, embellished with flower and heart die-cuts and adhesive letters.